Evercool introduces the Venti, a new processor cooler with a tower design. 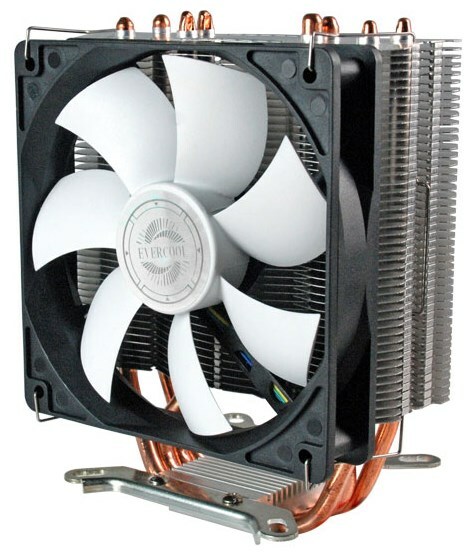 The heatsink features four 6mm direct-touch copper heatpipes and an aluminium fin array that is cooled by a 120mm EL bearing PWM fan that delivers 35.05-75.13CFM at a noise level of 22-38.1dBA. The cooler measures 125mm x 68mm x 160mm and weighs 588g. PWM fan to adjust the power of the fan efficiently,enable HPQ-12025 to obtain both cooling performance and quietness. HPQ-12025 designed with all metal clips provides a secure attachment on motherboard for Intel socket LGA775, 1366, 1156, 1155, 2011/ AMD AM2, AM2+, AM3, FM1.